We tend to get spoiled in art books and museums, which focus on an artist’s finest work. 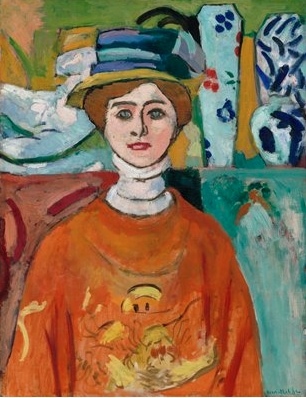 Clarifying to the eye, therefore, are shows such as “Matisse from the San Francisco Museum of Modern Art,” now at the Palace of the Legion of Honor in San Francisco. The show isn’t trying to be comprehensive; it’s what SFMOMA has in its collection. The superb stuff is certainly there–“The Girl with Green Eyes” is just one example. It’s great Matisse: bold, inventive, decisive. But a number of pieces aren’t on that level, and seeing so much variation in quality in one gallery is instructive for the insight it provides into an artist’s process of thought. I say “an artist” because all artists produce inferior things. 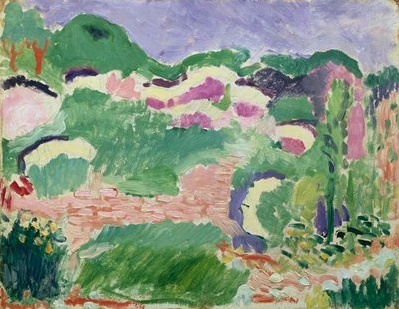 For example, “Landscape: Broom.” Clearly this is a study, an experiment–he’s trying out some shapes and touches–but it’s caught in vague middle tones, meandering and unfocused. Weak. “Flowers” suffers some of the same deficiencies. 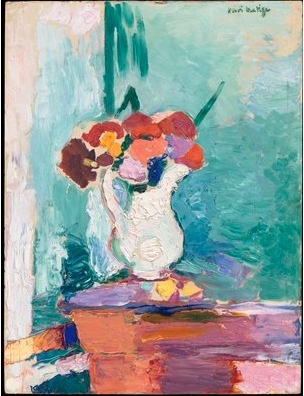 It has more focus: the flowers and then the vase are clearly the center of the action. But then the table and those odd stripes to the left meander down to the bottom of the canvas without apparent purpose or delight. A mess. Matisse signed it; he must have taken some pride in it. But if we encountered “Flowers” or “Landscape: Broom” out of the blue, I doubt we would look at either of them twice. March 16, 2013: Matisse bungles one? May 25, 2013: an artist’s reputation.